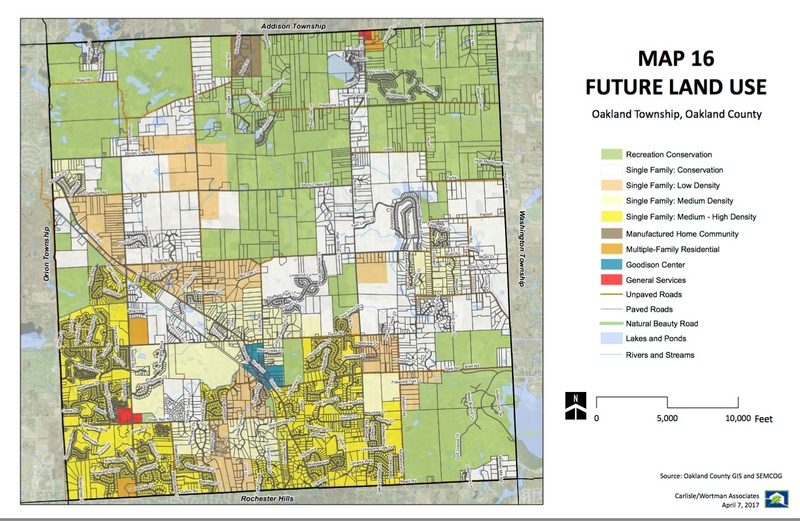 Oakland Township’s Planning Commission has been working on our Township’s Master Plan and Zoning Ordinance for several years. These are two of the most important documents that control the future growth in our Township. Recent public statements about the poor planning in the Houston area highlight the importance of good local management and control of future growth in a community. There have been MANY public hearing at the Planning Commission level, and some at the Board level regarding the content of these two documents. As a result, the Board will probably approve the documents unless there is some ‘fatal flaw’ that residents find in them. If you have not already participated in the earlier reviews, please look over the documents, and attend the appropriate meeting to voice your approval or concerns. This entry was posted in Uncategorized on September 10, 2017 by richardjmichalski. The following is a summary of the last four Oakland Township Board meetings held in July and August of 2017. There continue to be no controversial issues that have either been brought up, or created, by the Board. However, in the near future, the Board will be taking action on two items that will affect our Township for several years. Those two actions are the approval of the Master Plan and modifications to our Zoning Ordinance – Ordinance 16. A separate post will be published on those two items. Unanimously approved a contract for the purpose of Right-of-Way Phragmites Treatment Project with PLM Lake & Land Management in the amount of $6500. Unanimously approved the Rochester Hills – Oakland – Rochester Older Person’s Commission Fiscal Year 2018 Budget Resolution. Unanimously approved an Orchard Fencing contract with M.E.I. Construction for a cost of $14,000 from Historic District Commission appropriated funds. Unanimously approved a Lease Agreement between the Veterans Tribute of Oakland Township and Charter Township of Oakland with an amendment that the “Tenant shall also procure and keep in effect insurance coverage in the amount of $500,000 per occurrence for property damage to the Tribute, or in a higher amount based on a verifiable increase in the Tribute property value, with such coverage being in effect the day after construction is complete”. Unanimously approved Resolution 17-14 Regarding the Acquisition of Property through the Michigan Natural Resources Trust Fund to accept the terms of the Agreement for Stony Creek Ravine Nature Park Expansion project. Unanimously approved Resolution 17-15 Regarding the Development of Property through the Michigan Natural Resources Trust Fund. Unanimously approved the proposed Employee Benefits for the 2017- 18 Plan Year. Unanimously approved the Planning Commission reappointment of Gary Kwapis for a three-year term expiring September 1, 2020. Approved in a 6 to a vote, the Planning Commission reappointment of Anthony Scaccia for a three-year term expiring September 1, 2020 – Langlois was dissenting vote. Unanimously approved the hiring of Young’s Environmental Cleanup, Inc. for the purpose of cleaning the storm drains at Fire Station #2, the Township Hall parking lot, and disposal of said goods at an amount not to exceed $5,000. Approved in a 6 to 0 vote (Reilly was absent) the Oakland Township Water System Operation and Maintenance Agreement. Approved in a 6 to 0 vote (Reilly was absent) the reappointment of Brian Blust to the Zoning Board of Appeals for a three-year term expiring September 1, 2020.